Mashallah what a beautiful nasheed by brother Junaid Jamshed. Every bit of the lyrics is so true subhanallah! We are indeed on a journey towards our Lord, whether we like it or not! May Allah swt help us in preparing for the great journey, Ameen. I have copied the lyrics in English for the people who may not understand urdu. Alhamdulillah Ramadan started on Monday 1st of August. Today is the 3rd day of fasting. Alhamdulillah it's going well. I was worried that I may find fasting very hard as I am also breastfeeding my three months old baby. Apart from feeling a bit exhausted and thirsty, I am doing fine alhamdulillah. It just reminds me that Allah swt makes everything easy for us . I am trying to read one juz of the Qur'an ( around 20 pages) every day. I did do this last Ramadan as well but this year I am planning to read the tafseer too, insha-Allah. I still do come online everyday due to my magazine work but don't spend a lot of time online anymore, especially on Facebook :-) Alhamdulillah. Yesterday I went to the local sisters' halaqa, alhamdulilah as usual the talk was full of wisdom. Insha-Allah will blog about it soon insha-Allah. I am listening to talks on-line and trying to learn more about the deen insha-Allah. Through the Ramadan journal I would love to share whatever I am learning, alhamdulillah. I have been listening to basics of Fasting by Sheikh Hamza Yusuf, mashallah. Alhamdulillah I always learn something new from his talk. 1. The crescent moon is not really an Islamic symbol. It was never used during prophet Muhammad sallallahu alaihe wa sallam. Islam as a faith does not have a symbol. 2. Prophet Muhammad sallallahu alaihe wa sallam did get married in Ramadan. I haven't seen anyone getting married in Ramadan. 3. When someone is suffering from diseases like diabetes and are needed to have medication on a regular basis, they should not fast as our body has a right on us. Fasting may cause harm so for people in sickness fasting can be even haram (prohibited) subhanallah! Mashallah some amazing facts about our body and the benefit of fasting. 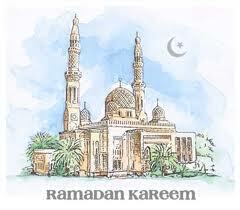 May Allah swt help us to do our best in this precious month, ameen, ameen, ameen.